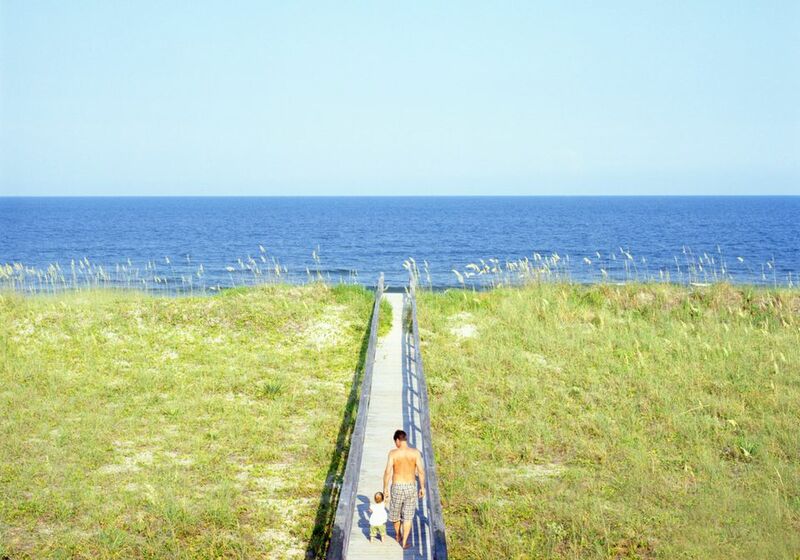 On the southern coast of North Carolina, Carolina Beach and Kure Beach offer a relaxed, family-friendly vibe. They're also less commercially developed than many other beach towns in the southeast, like Emerald Isle, so you're more likely to find gorgeous scenery and laid-back activities than packed waterparks and crowded bars. Both Carolina Beach and Kure Beach deliver a classic beach town experience, with lovely stretches of sand and fishing piers. Both Carolina Beach and Kure Beach are staffed with lifeguards from Memorial Day through Labor Day and offer restrooms and concessions. Also in Kure Beach, the Fort Fisher State Recreation Area offers miles of unspoiled sand and is a great place to hunt for seashells, sea urchins, fossils, and starfish. A designated swimming area is staffed with lifeguards from Memorial Day through Labor Day. Named one of America's top 10 boardwalks by both Food & Wine and Budget Travel magazines, Carolina Beach Boardwalk features seaside amusement rides, classic arcade games, and weekly summer fireworks. There are also a splash pad park, cool-off stations, historical and educational kiosks, and swings. The Travel Channel has named the North Carolina Aquarium at Fort Fisher as one of the best aquariums in the U.S. Highlights include the touch tank where kids can feel a live bamboo shark, a Dolphin Discovery experience, a butterfly exhibit, an interactive 3-D Whale Quest game, and Luna, the aquarium’s beloved albino alligator. Kids can burn off any excess energy at Adventure Reef, an outdoor play zone. Open since 2013, the Ocean Front Park in Kure Beach has since transformed the town's beachfront. The public seaside green space features a boardwalk, playground, swings, rain gardens, oceanfront benches, and public restrooms. Kids ages 3 to 6 can play in the “tot lot” playground with its giant pirate ship, fish, and turtle structures. Summer family programming includes weekly concerts, fairytale storytelling, and turtle talks, where kids can learn about the sea turtles with the local Pleasure Island Sea Turtle Project. At least once during your stay in Carolina Beach, you'll have to start the day off right with a hot stack of pancakes from Kate’s Pancake House. This local favorite serves southern brunch favorites like pancakes and waffles in a family-friendly setting. Although the no-frills diner has typical breakfast plates, you'll also find fancier options like crab cake Benedict, a cajun chicken omelet, and cream cheese–stuffed french toast. Catching fish off an ocean pier is fun and inexpensive for kids and adults alike. Built in 1923, the Kure Beach Fishing Pier is one of the oldest piers on the Atlantic coast. This pier features outstanding fishing and gives kids the chance to see miles of coastline without having to perch atop mom or dad’s shoulders. The pier also has an arcade with classic games and for the little ones who deserve a sweet treat on a hot day, ice cream is easy to find. You can rent a rod and reel for just $5 per person. There's no alcohol allowed here, so the crowd is much more family-friendly. There's also a pier in Carolina Beach: the family-run full-service 700-foot pier offers a small snack shop as well as a tackle shop where you can rent affordable equipment. From April through September, Tony Silvagni Surf School runs surf camps with a 2:1 student to teacher ratio, meaning your kids will be well supervised and get plenty of time with an instructor. Campers receive hours of professional surf instruction and learn about water safety and surfing etiquette. Take a hike with a park ranger and learn about the carnivorous plants that grow at Carolina Beach State Park. Plants that bite back include sundews, bladderworts, butterworts, pitcher plants, and the Venus flytrap. Kids ages 6 to 12 can participate in a Junior Ranger program that explores North Carolina's natural heritage. Carnivorous Plant Hikes are offered most weekends. During the Civil War, the Confederacy built Fort Fisher in Kure Beach, which would become the largest and most important fort in the South. Two major battles were fought here: appropriately named the First and Second Battles of Fort Fisher. You'll find a fully functional replica of a seacoast cannon at the fort today, and you can take a quarter-mile walking loop to encounter underground bunkers. The 11-acre Carolina Beach Lake Park hosts a free Sunday night movie series with a lineup that includes first-run Disney films and other blockbuster family favorites. You'll also find gazebos, restrooms, a sheltered picnic area, and a playground. Paddleboats operate daily during the summer. For a fun way to get around, Wheel Fun Rentals in Carolina Beach offers surreys, mountain bikes, beach cruisers, tandems, as well as choppers, quad sports, and deuce coupes. Founded by the Britt and Wright families in 1939, this donut shop has long been the cornerstone of Carolina Beach's boardwalk area. The nostalgic favorite is famous for its classic glazed donuts. It is open mid-April through October. With more than 4,000 flavors of homemade ice cream, Squigley's is a legendary must-stop on any family beach getaway to Carolina Beach. A “squigley” is soft-serve ice cream blended with a variety of mix-ins. Kids can pick from a wide selection of flavors and ingredients to invent their own unique squigley creation.